Affordable Accoutrements: Keeping it Simple? 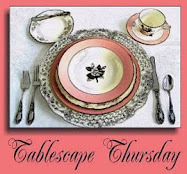 It's time again for Tablescape Thursday with Susan of Between Naps on the Porch! For my first table of the new year, I decided to keep it simple. 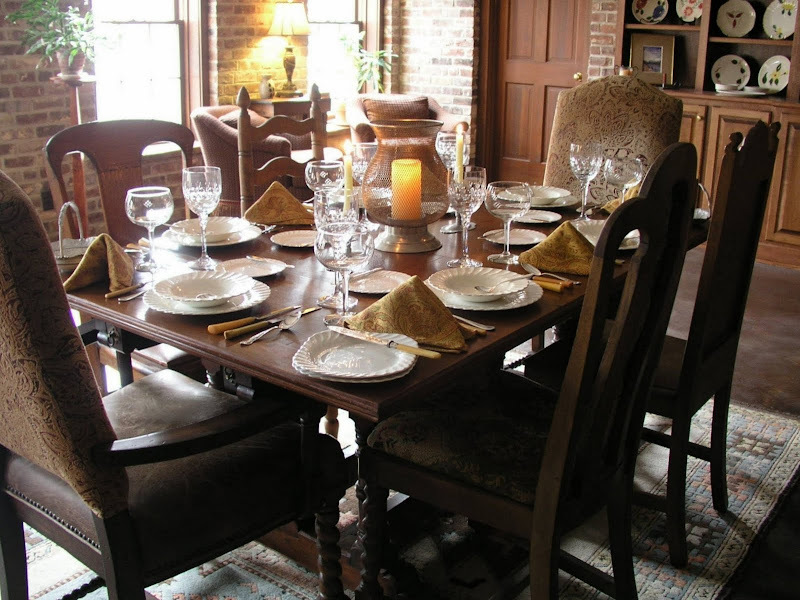 We're going "below stairs," where I set a table for you once before (HERE). It's not a formal space, and it's not usually staged as a dining room. I like the idea of redesigning and repurposing rooms in our homes when we're entertaining guests ... or simply to suit our moods and keep things interesting. My "simple" setting ended up involving more work than I'd originally intended. I decided to move the table nearer to the fireplace. That meant the sofa had to be shifted out of the way, and the lounge chairs and coffee table had to be temporarily moved to the studio (the room on the other side of the fireplace). What was I thinking??? I hope you'll like the result! The dishes are vintage ironstone by Johnson Bros., England. Over time, I've purchased (very inexpensively) numerous pieces at local Goodwill stores. Some are white; others tend to be more cream-colored. Several exhibit surface crazing in the glaze, but I think that adds to the timeless, traditional feeling of these classic dishes. You can clearly see the crazing on the square-ish salad plate. We tend to think of this shape as being very fresh and contemporary but, obviously, it's not a new concept! The knife was labeled a "1920's Celluloid Fish Knife" in an antique shop. With its serrated edge, I think it works well for slicing small, crusty loaves of bread for dinner guests. It's a table for six. I brought in mismatched chairs from various rooms of the house. I used tall stemmed water glasses by Towle. The pattern is Marquis. The vintage/retro balloon-type red wine glasses came from a local estate sale (for around one dollar each). For less formal tables, I enjoy using vintage aluminum serving pieces. They're often available at thrift stores, estate sales, and antique malls at very reasonable prices. They were produced from (mostly) the 1930s through 50s in every imaginable shape, size, and pattern. I think they're fun to collect and great for adding a special touch to today's casual style of entertaining. It's a hazy day, but the windows still provide natural light for the space (especially with the leaves off the trees). The plate collection displayed on the shelves is David's. It began with the ones that were displayed on his mother's and grandmother's kitchen walls when he was a child. The hand painted Blue Ridge dishes were produced from the 1920s - 50s by a Tennessee company, Southern Potteries. Read about Blue Ridge China HERE. I saw a table set with mismatched Blue Ridge plates recently at an antique mall, and it was charming. If you like, I'll set a similar table for you for an upcoming Tablescape Thursday. 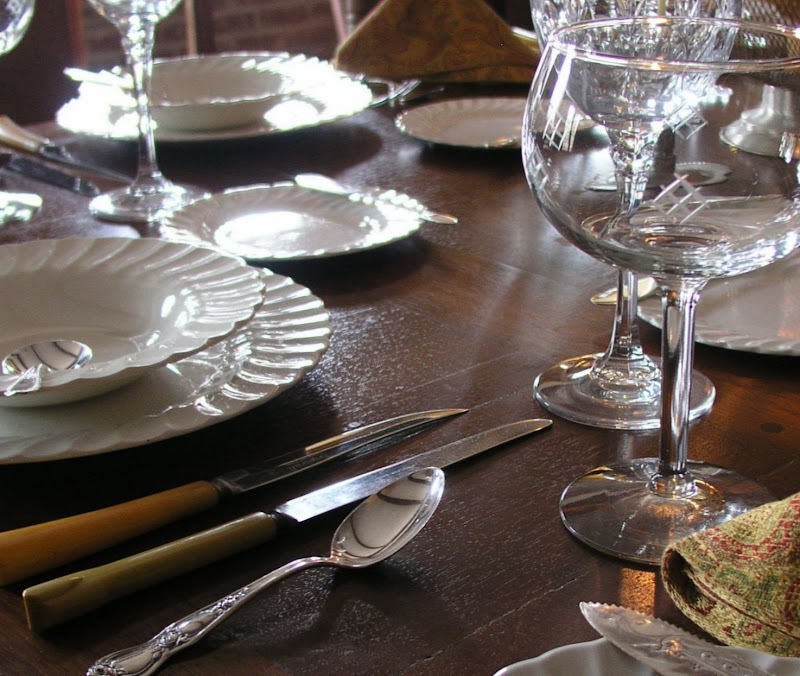 The flatware, like the chairs, is an assortment. 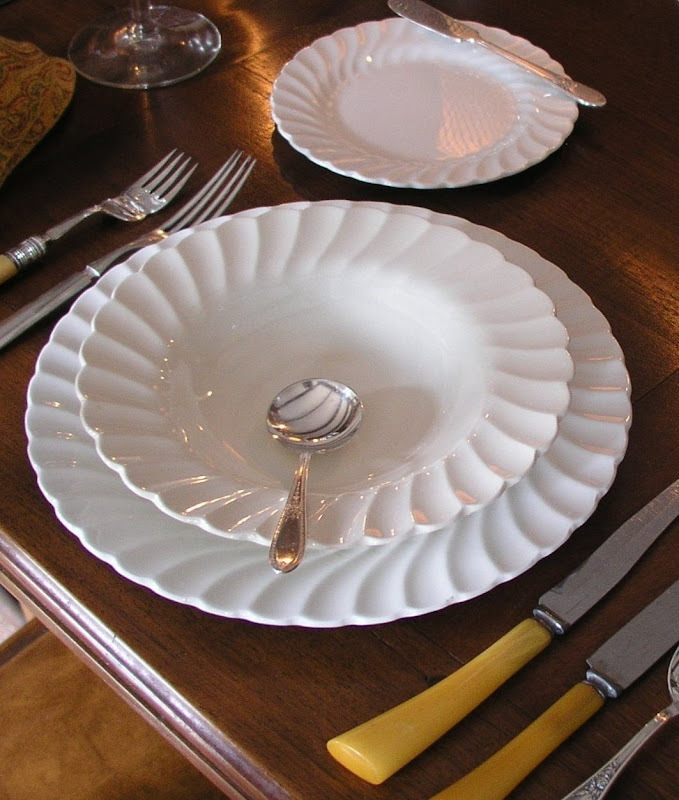 The vintage celluloid/bakelite handled flatware combines well with older silverplated or sterling pieces. It can be relatively expensive if purchased in full sets, but individual pieces can often be found for a dollar or two in "dig boxes." The odd looking lines you see on the soup bowls and spoons are reflections of the beams above. Some of my art books line the shelves in the background. The fire definitely makes things cozy. The logs are gas (unvented) and produce enough heat to warm the space quickly. The fireplace formerly burned wood, so the bricks developed a nice patina over time. Won't you come and join me? Omar Khayyám was right ... what could be nicer? Don't forget to join Susan of Between Naps on the Porch for Tablescape Thursdays and visit all her talented participants at their creative, inviting tables! I think this is my favorite room in your home, Bill. I absolutely love it! Your simply table is simply gorgeous. Dear Bill, just tell me what time and I'll be there. I love how even your simple tables are still elegant! 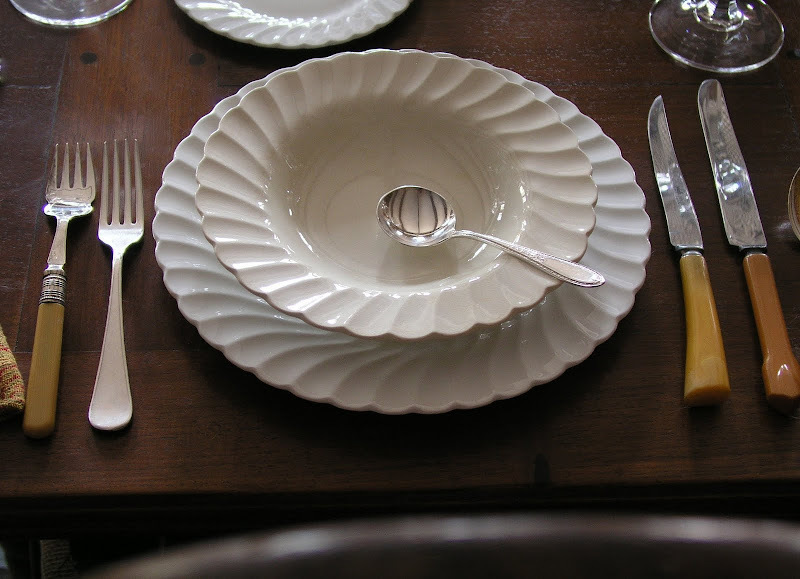 I love the white ironstone (I see pieces all the time at the thrifts and I will start picking them up now) the interesting silverware and aluminum serving pieces. Candlelight, firelight and a warm and lovely room. Voila! Thank you for showing us that simple does not mean boring or plain but glowing and lovely in its simplicity! Oh and YES I would love to see a table set with the Blue Ridge Pottery. I will unpack mine sometime this spring and try to do a tablescape with it. Bill, this is gorgeous!! The table setting is wonderful...but I LOVE this room!!! The table and chairs, I LOVE!! And tht exposed brick?? Oh my stars!!! LOVE~LOVE~LOVE!!! So warm....LOVE IT!! Did I already say that?? This is the kind of room that ALL women and men dream of owning. It is so full of charm and personality. Your table may be simple but it is also stunning! 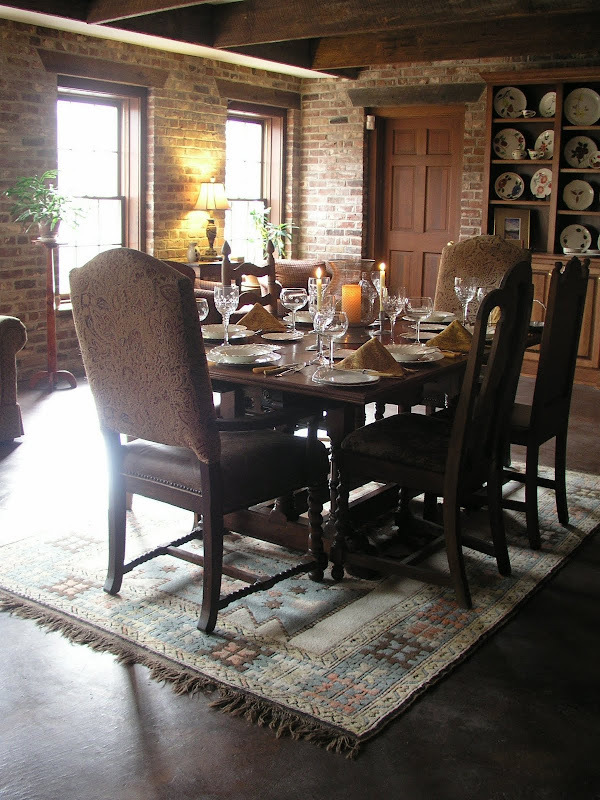 Bill, this could become my favorite spot for your tablescapes...love the old world feel of this room. 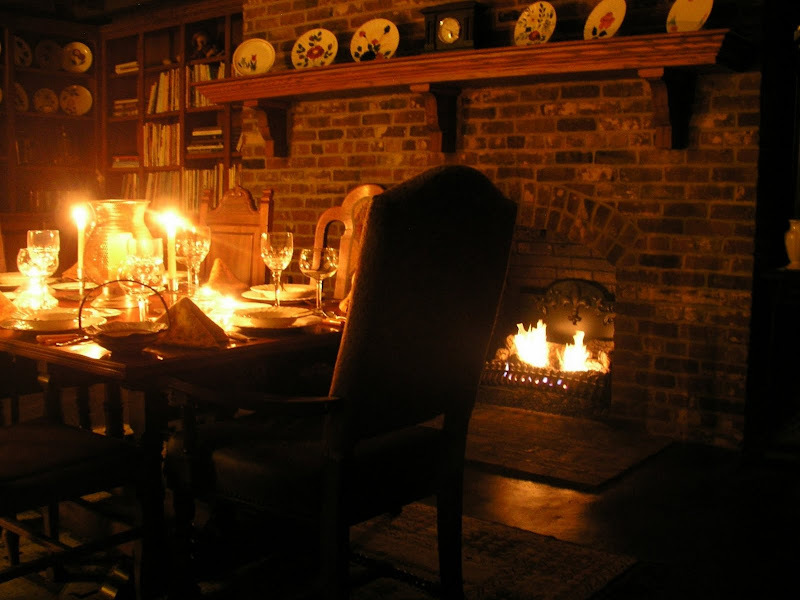 And dining by a fireplace...nothing could be more wonderful! 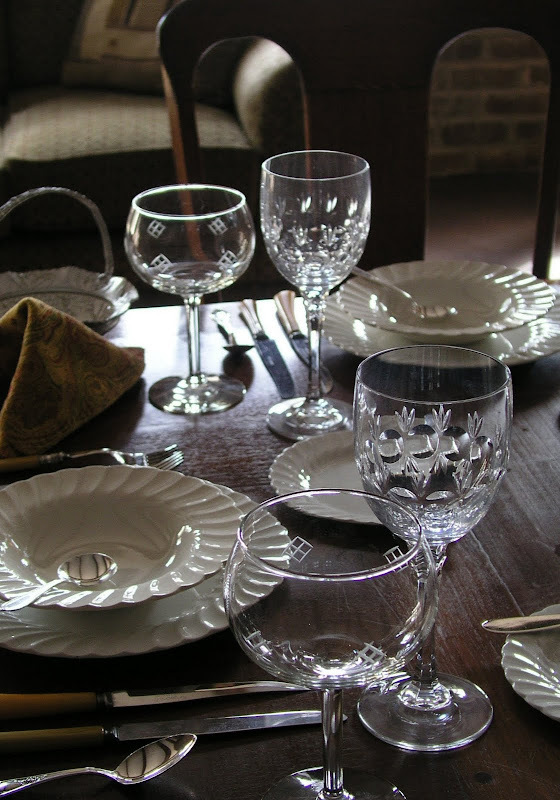 Love your beautiful collections of flatware, china and crystal. When I was out antiquing on Saturday, I saw two pieces of aluminum and thought about you. They were nice lidded casserole type dishes with fancy turned, sprial type handles and neat details. And the prices were very reasonable. So, what happen to Mr. Kitty? Did someone snuff him out quickly? Bet he was none too happy about his tail. 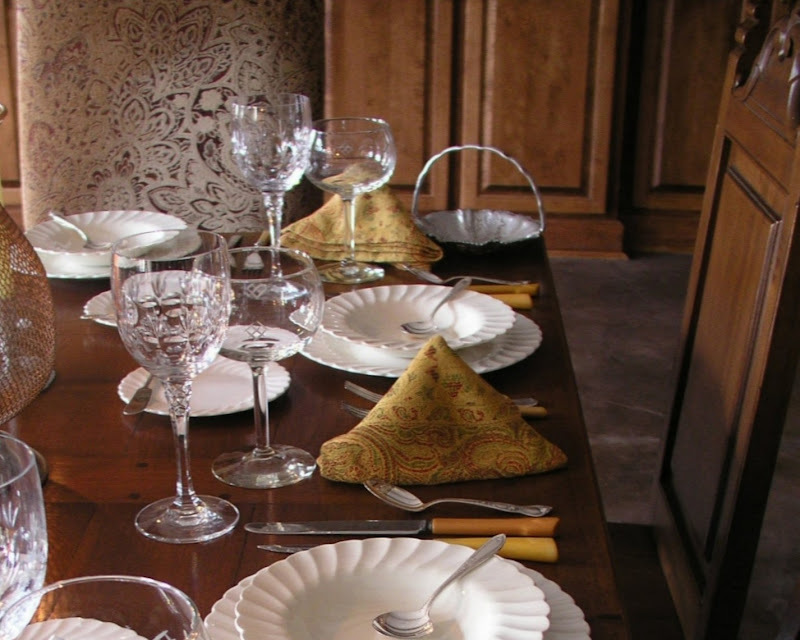 ;-) David has a wonderful collection of china...beautiful backdrop for your cozy tablescape. This room is just stunning. Such a casual elegance and I am loving those napkins. Once again, you have accomplished a work of art. I love the rustic formality of this table with no linens so you can see and "feel" the natural wood. 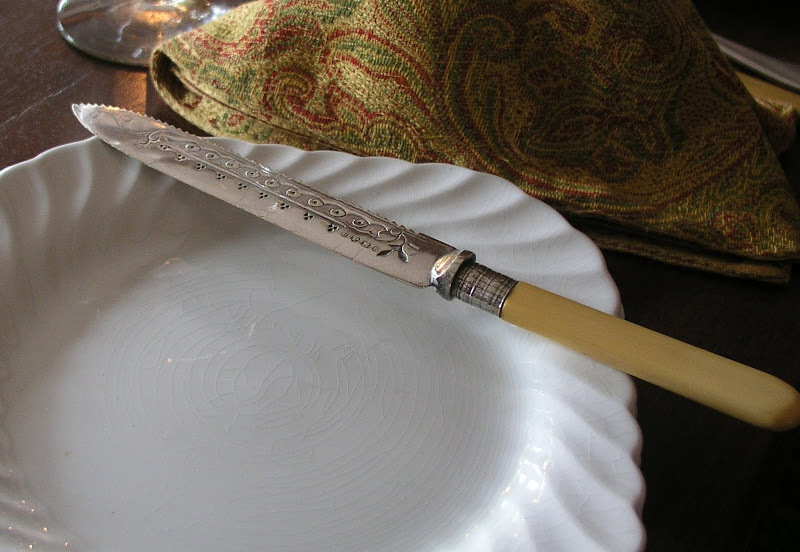 And that fish knife is gorgeous. I'm feeling the warmth of a thick chowder just looking at this tablescape. Lovely, really lovely. The fire makes the setting almost medievil...so and intimate and cosy. Bill :) You have done it again with another incredibly beautiful tablescape for us to behold! Your taste is impeccable and that room you choose this time... Gorgeous! Of course my fave is the fire and candle light! Thanks for climbing the bar for that great shot! I love this room (I've said this before!) It's my favorite of all your rooms. 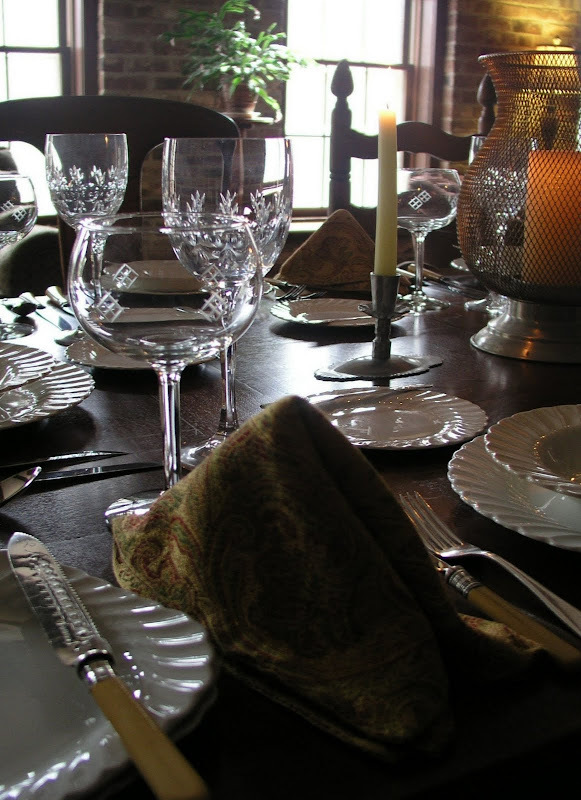 And the table setting is beautifully simple...the way I prefer things these days. White dishes are my absolute favorite. They are so versatile! The floor in this room has really caught my eye. I may just have to talk my husband into trying this technique. Thanks, once again, for your inspiration. Okay first of all I am sure Susan didn't mean "snuff him out" like it sounded did you Susan? Our lab has a real waggy tail. We have lost many a wine glass off the coffee table and have almost had a torched tail. I was so happy when we switched out wood burning fireplaces to gas. Those knives are really special. The napkins look like they match the upholstered chairs. Lovely table setting. Warm and cozy, inviting, I would expect nothing less from you. Bill -- what a charming table. I like "simple" tables as well as elegant ones. It couldn't be more perfect with the assortment of cutlery (and I did spy an English fork). I like the bare wood, the napkins are perfect! As is the white china! 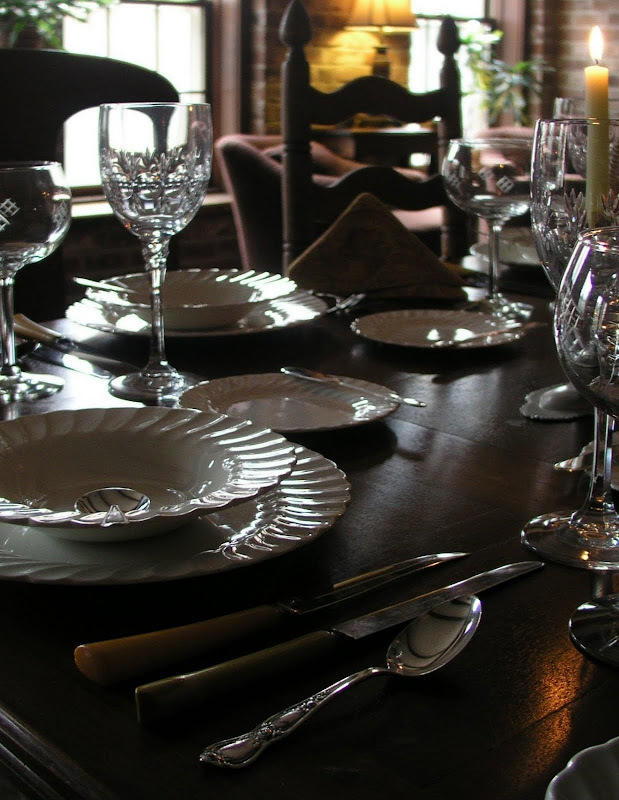 You are a master at table setting! Have you been to the grocery for bread and milk yet? This bitter cold is bad enough, but adding the white stuff is going to really be bad. I am aready for 75 - 80 degree temps again. No fair...even your simple is elegant. I loved this room when you did your other tablescape and I still do. It is so cozy down there and I love the furniture. You never disappoint! I've always wanted a fireplace in my dining room -- not a chance in this house - but a girl can dream. I love your photography -- and I'm certain that it's 99% your artistic talant -- but what kind of camera to you have? I'm going to "step up" next year and am gathering info from some of you great photographers. Awesome flatware, but simple? Just beautiful. as always. Bill, I do remember the previous post in this room. I find this space totally charming, so warm and inviting. As for your simple table... I don't think anything you create is simple, but I do relate to this one. It is my kind of table. 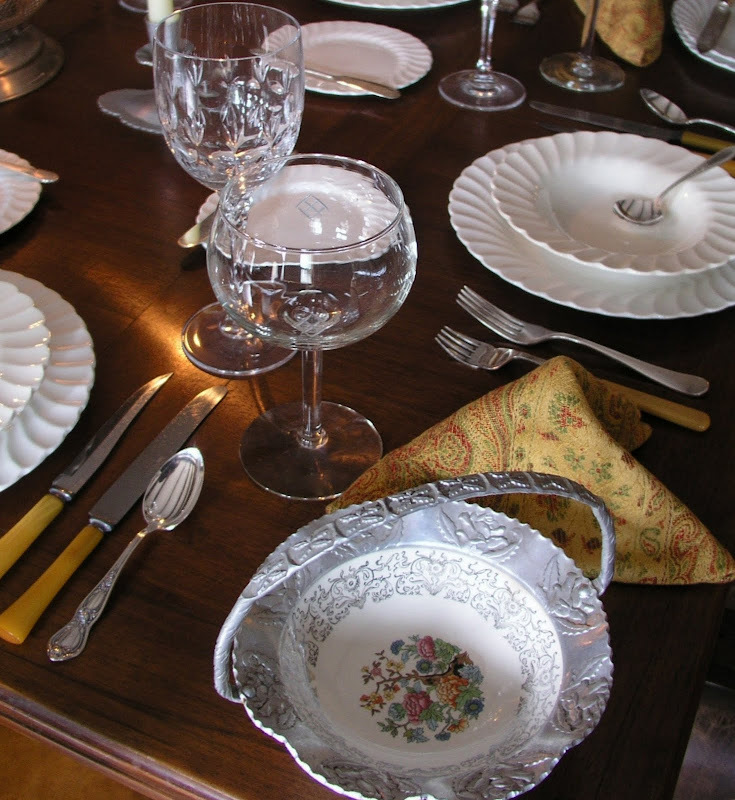 I don't have a huge assortment of fine china or crystal, so I often have to use the same things again and again with a bit of a twist. I do have plenty of variety in pottery, but that's not the formal look of your tables. So, I guess that's why I absolutely love this "simple table". You have a winner here as far as I'm concerned. And yes, I'd love to see you set a table with the Blue Ridge china. Great job, Bill! It's delightful. I love the ambiance of being near the fire, the white dishes, and my favorite... the goblets. Love the cut work on them. I also love the handles on the knives. NEAT! I didn't get a good look at David's plates (I'm going to try to enlarge the pic so that I can see them), but I will try and check out the company. Thanks for sharing! Bill, This is a smashing table! It has a very old world European feel. Very simple but oh so elegant. All the effort you took to move your furniture around to accomodate this tablescape is so appreciated and well worth it. Your choice of colors with the white ironstone lends a warm, lustrious feeling. The napkins were a real prize. They look lovely with this table. Everyting is perfection! 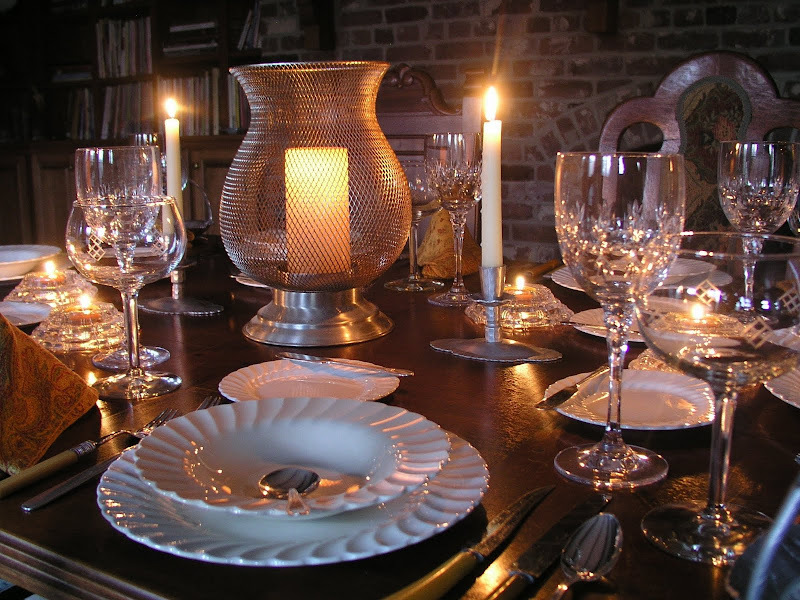 Bill - why I slather my keyboard with drool each time you post one of your beautiful tablescapes, my heart skipped a beat when I saw this one. This one speaks to me. Its warmth and casual-elegance just draws me right in and makes me want to sit down at that table and never leave (at least until uyou call the cops and make me) LOL It is just breathtaking, as is the setting. That room is gorgous!!!! I thought your daytime pics were beautiful, then I kept scolling and came to the night time shots...and again...I was breathless. I so look forward to your tablescapes, and your knowledge of dishes and stemware, etc, simply astounds me. Thanks so much for going thru the extra trouble for us. It was sooo worth it! Hi Bill, that is my kind of room and table setting. As a non drinker I would prefer less glassware. I love the informality. You are certainly climbing to great heights with your photography!! could you send me a quick email and let me know what a "wet bar" is, not something I have heard of in England!! I love the way you have the refelction of the beam in the soup spoon. 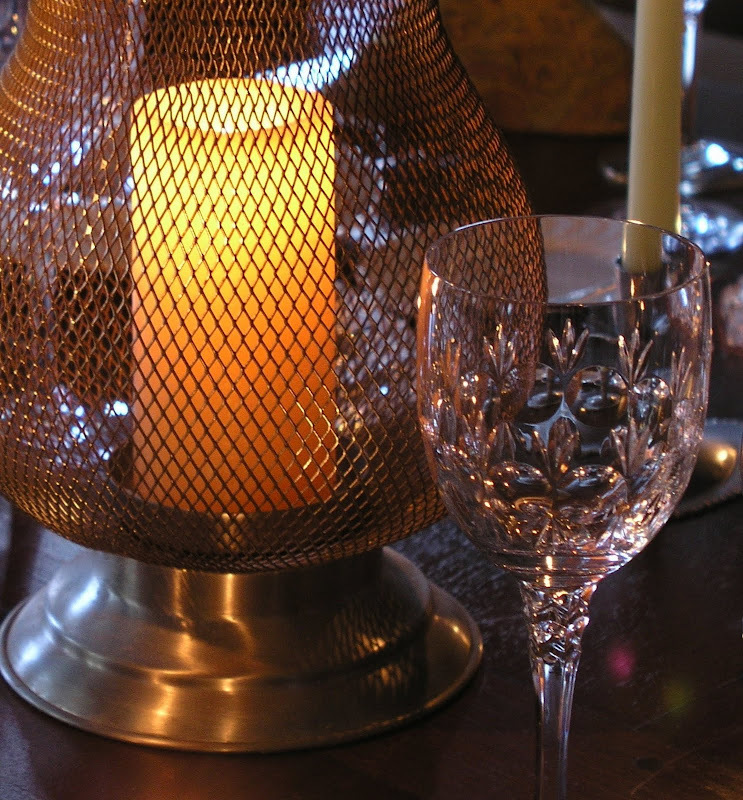 I also love David's mesh candle holder, great taste. You are truly a Renaissance man! This could be a table set for a sumptuous feast in gothic times or a 21st century meal all ready to accommodate modern day visitors. The tapestry fabrics in both the chairs & the napkins lend a very European feel to the whole scene. 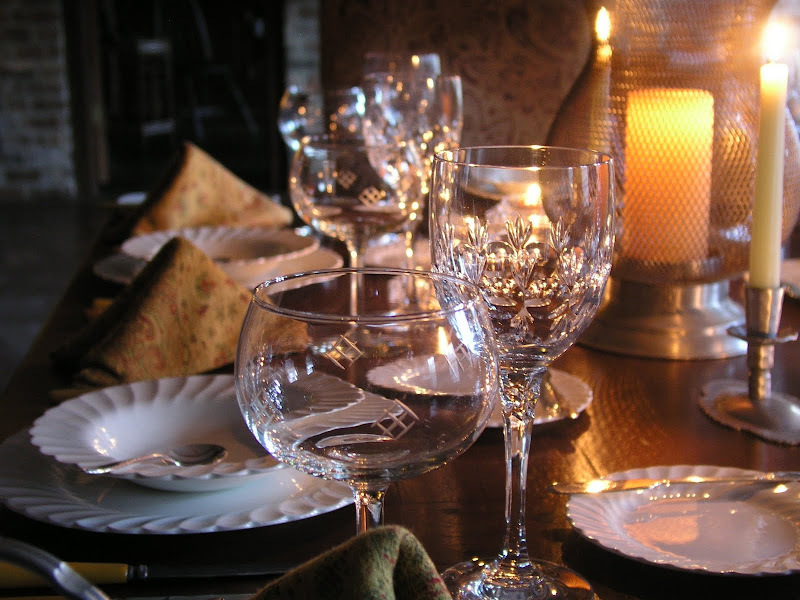 The different stemware makes for a very interesting & eclectic look which is rapidly becoming your trademark style. I'm still putting away Christmas decorations so no tablescape for me this week. Too tired! Thank you again & again for all the inspiring posts you provide. I know you're especially proud of this post. Both the table setting and the room just screams "wow". I cannot believe you haven't used this room more often. Everything is just picture perfect. In fact, paper plates and cups would look fabulous in this setting. 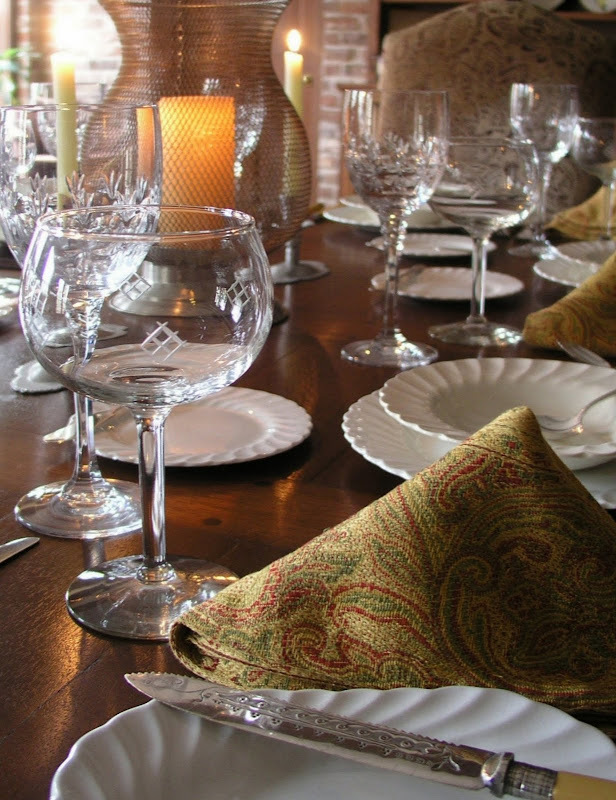 Your artful table setting just puts the room at the over the top beautiful mark. A great way to start the 2010 tablescape year off. Bill, I believe that Barb from Grits and Glamour said it best - "I (too) slather my keyboard with drool" for all of your table settings and the rooms that surround them! Warm, elegant and gorgeous. The old world feel is marvelous. I love it all. You are a wonder. Just beautiful, I see nothing simple about this tablescape. 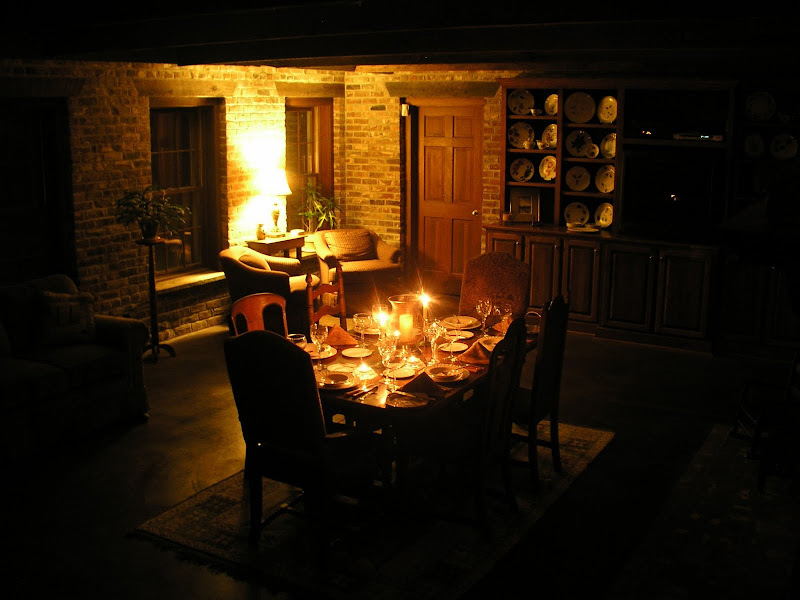 I loved the whole room, all the brick and wood, made it look so warm and cozy. Thanks for sharing. Bill the table settings are wonderful. I agree that there is something about winter that makes one want to have things a little more clutter free and sparse. The fish knife is awesome, I mean that literally because I am awestruck with the detail on the blade. What an amazing find. 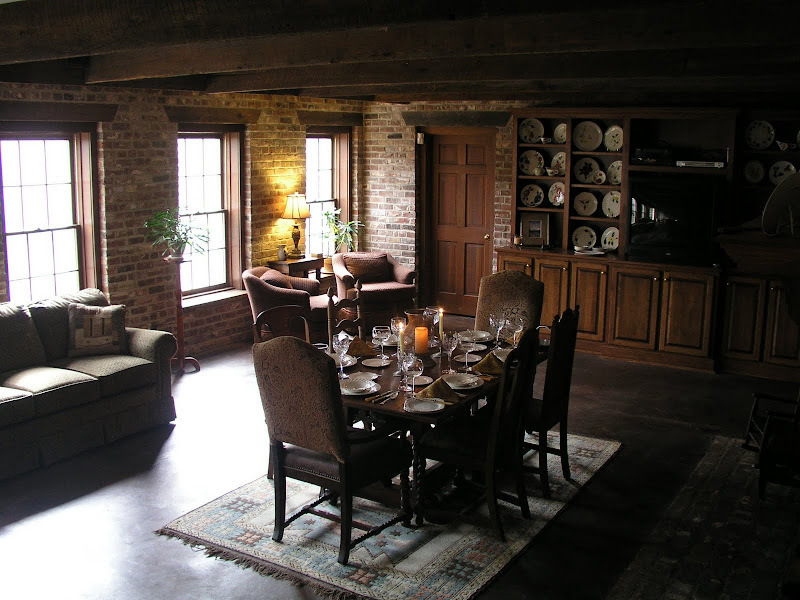 I am also lusting after your room with it's brick walls and timbered ceiling, it's simply amazing. May I use one of your photos to add to a post on my blog? I would like to share your blog and especially this most recent post with the folks who visit me. Bill this table is elegant and inviting! Another great job! !Absolutely beautiful!! Oh what a grand room this is. Love the setting. The sparkly crystal is beautiful. The photographs are fabulous!! You always have a way of wowing me Bill!! What a warm and cozy room! And the table is equally inviting, just lovely..
Reading your posts is like watching the sun drop behind the horizon..beautiful. I certainly did think the square plates were very new and contemporary. I guess nothing is ever really new. I adore that fabric on your chairs!!. You have done a fabulous job making a space with what could be hard lines warm and inviting. You may call it simple, but I call it gorgeous! Lovely rustic room contrasting with the china. I always love to look at what you are up to. Thanks for brightening my day. Stunning!!! 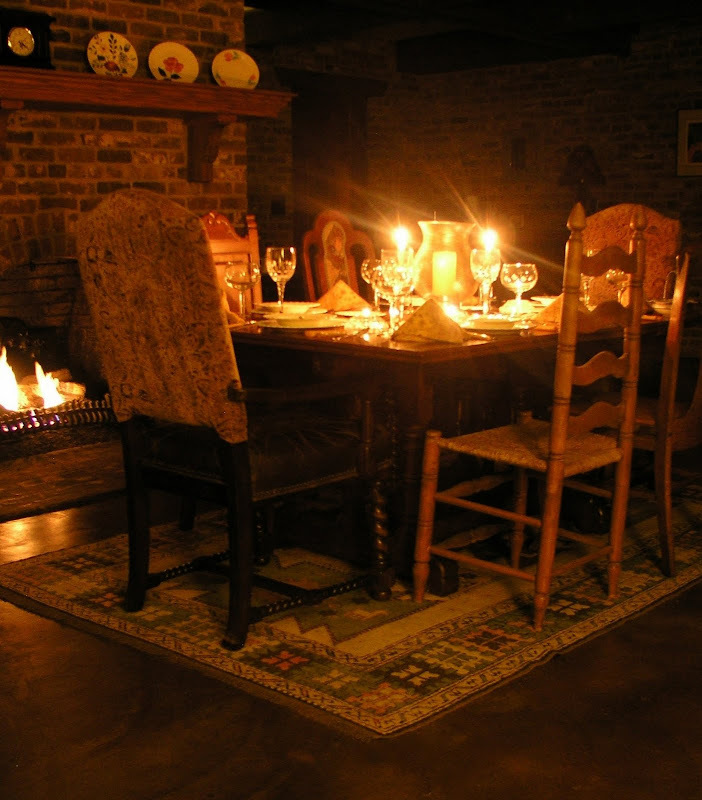 I love how cozy it looks by the fire; and it shows how perfectly a "simple" table can be beautiful and breathtaking! 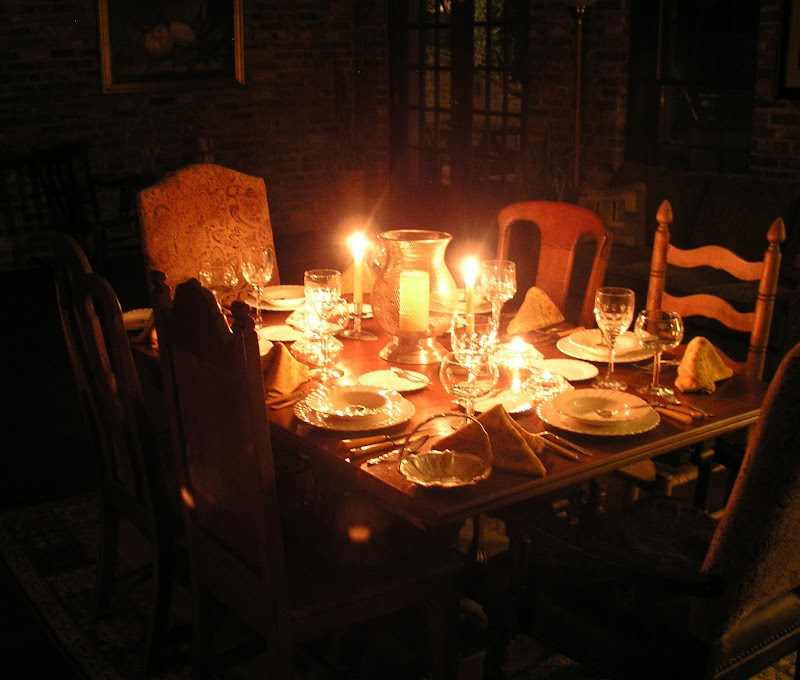 What a way to start the new year~it would be such a special treat to sit at your table. The fish knife is enviable. 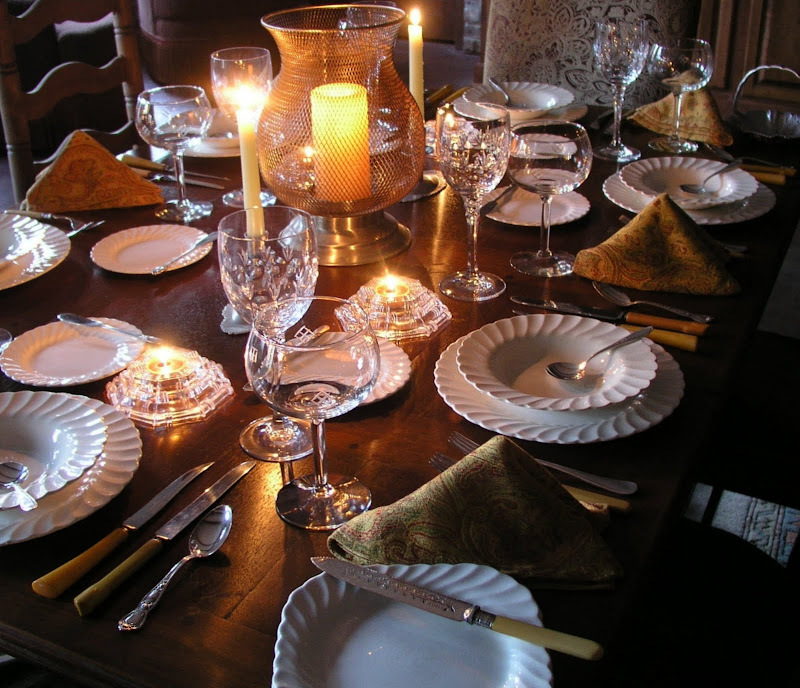 Bill, I love the Euro feel of this table setting and it has a cozy more masculine feel which is very nice. I enjoyed this post. Of course, the table is beautiful...that knife is fantastic...but I love that room! It is gorgeous! 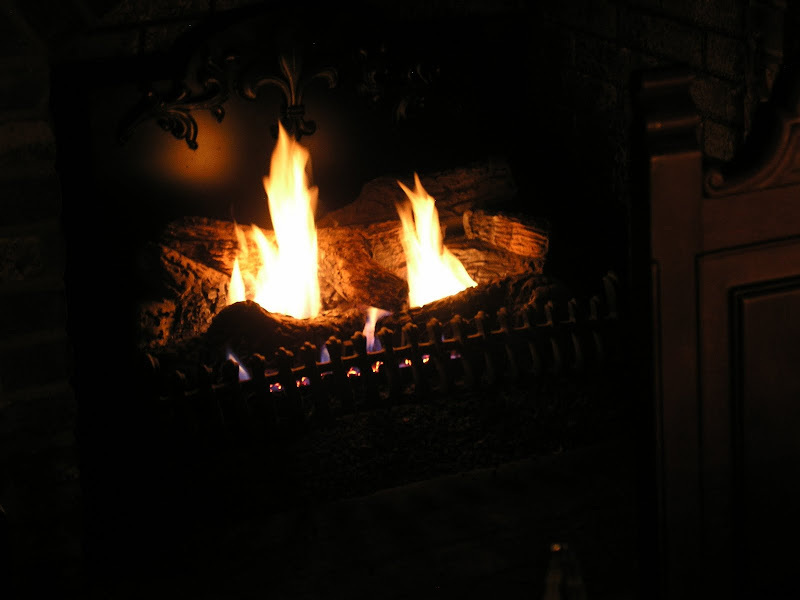 Everything just looks beautiful, I love fireplaces, I would have one in every one if I could! Bill, I must tell you that the first thing I do every week (TT) is scan for YOUR name. I love your tablescapes AND the narrative. I visit every week... despite being so busy getting ready for the move to Palm Springs. It's just beautiful, Bill. Your tablescapes are always amazing. You definitely have a flair. I am curious about the kitty - did he get too close to the fire, or a candle? Hope he's okay! I just want everyone else to know that I try to visit as many of you as possible. There is So much talent showcased every TT! First off before I get sidetracked, the tablescape is beautiful! The room however is to die for. So cozy and inviting. This would be a great spot for a romantic dinner for two also! The bricks the beams and bookshelves, I just love the feel of it. You and David have a beautiful home, I would love to see this room more often. I didn't see an e-mail address for you, so I hope you'll check back here for an answer to your question. The kitty is fine! The "tail on fire" incident happened several years ago, and it was from a candle. Normally a fireplace screen is in front of the fire (I removed it for long enough to snap a few pictures) and there are no open candle flames in the rooms Lucky has access to. 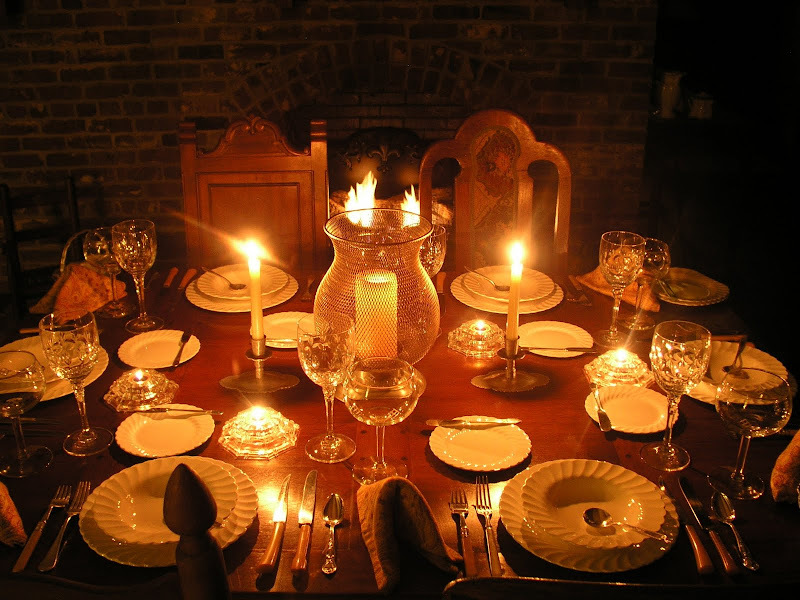 The table is normally used as a library table, not for dining by candlelight. His tail was barely singed, put out immediately, and he didn't seem to realize anything had happened ... although I don't know how he could NOT have noticed that awful burning hair smell. The tablescape is just beautiful, as they always are. I love that room, looks so cozy and inviting on these cold days! Hi Bill! Your home must be stunning! This table and room are beautiful. Your table may be simple but it is elegantly timeless and suits the room perfectly. I would love to be your guest here one day. Stopping by on the recommendation of Bunny Jean ~ she thought I might pick up some pointers on photographing crystal. 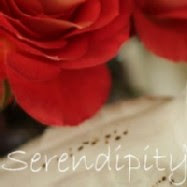 Sure glad she mentioned you, as I can now enjoy as you share the lovely tablescapes and photos you have created. Such an inviting place, indeed! Elegant and cozy all at once. All of the additional work of furniture shifting resulted in an inviting room with the focus right in the center ~ where a gathering of family or friends should be. Nice visiting with you today! So charming, and so cozy,thanks for invite into this lovely place. There is nothing simple about your table, Bill. It's absolutely gorgeous. And I love the room. I remember it from the last time you did a tablescape there. This is just breathtaking!! I absolutely love the napkins. I also love the Blue Ridge china, so I would love to see what wonderful table you come up with for that. Gorgeous!! Hi Bill! Happy New Year! Love the table. even though it's white and crystal it's sooo warm and inviting in your room. Love the Aluminum...oh wait of course I do.....I have both of those baskets LOL. 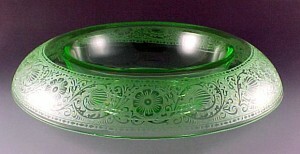 I have other serving peices in both patterns. I'll have to show you sometime. I want to come over and have dinner at your lovely house. It is all so wonderful and that fish knife is such a unique piece to own. I love the fire and the candles and the chairs too. Thanks for sharing. Bill, I love this cozy room. I'm not sure if you've moved or what...love it. I love that Blue Ridge pottery. I have a set of 8 dessert plates that my g-ma gave me. I also love your fish knife and crystal. I just discovered your lovely blog, what wonderful eye candy you've got here! How on earth could I have missed you this long? So nice to meet you, and have a wonderful weekend! Beautiful room, table, lighting; you must be the perfect host! Bill, you have the Midas touch, everything you do is elegant, beautifully vintage and classic, with style and grace to entertain royalty...I think it is in your DNA...somewhere in history you were on the staff of the Royal,a gifted artist who made royalty look fabulous with the creativity of an artist skilled to do presentations of magnificent proportions...You sir, are very, very, gifted!!! I thank your for your comment on my father's wood sculpture, it tickled me and him!!! You ARE AN ARTIST TOO! One of the prettiest tables I've ever seen, I love it all! 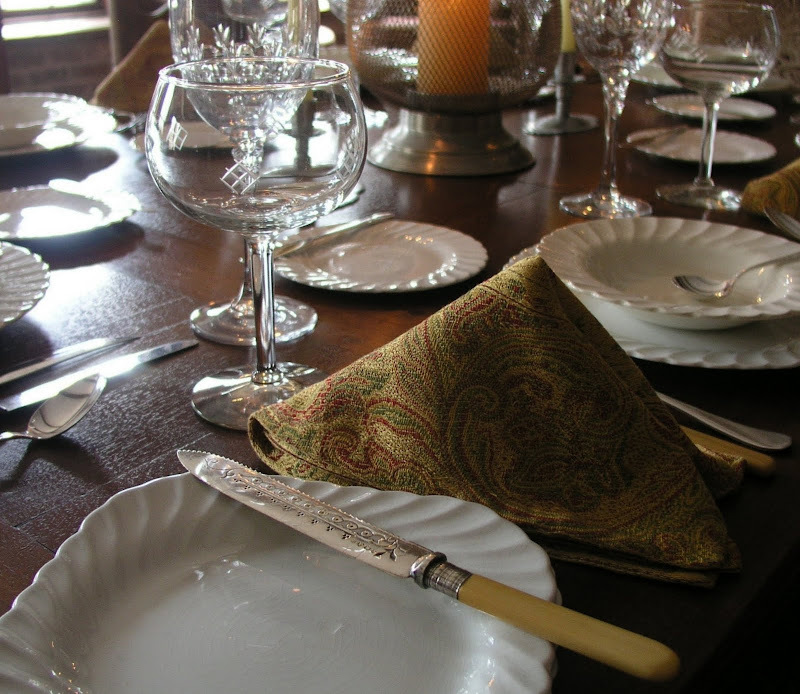 I especially loved that fish knife, such a wonderful idea to use it for bread, it's really beautiful. And that room! It's perfection! I would want to spend all my time there, especially with a fire going, so cozy and so inviting! Expect me next time you are serving a loaf of bread and a glass of wine there! 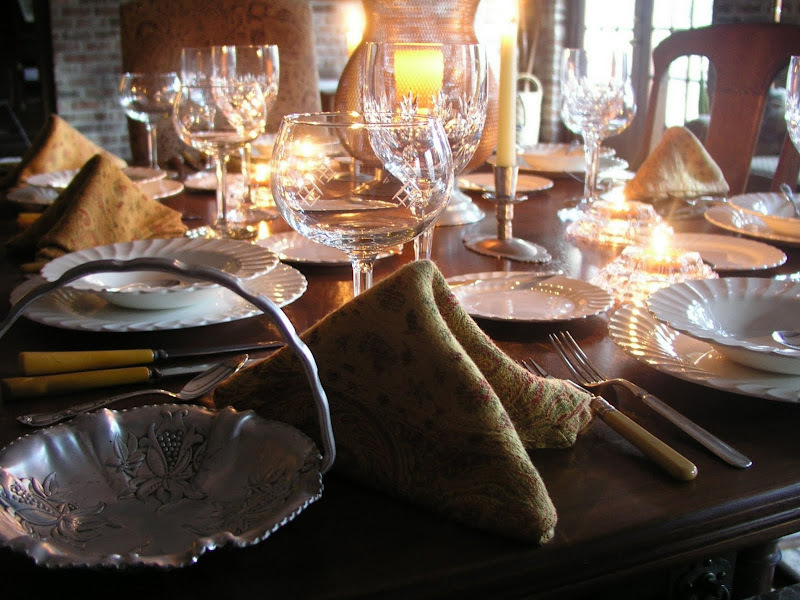 PS ~ I would love to see a tablescape with David's wonderful family treasures! Bill ... absolutely beautiful .. as always each week I'm more impressed and in awe. I couldn't help noticing the floor .. is that stained concrete?? If so .. did you do it or was it already like that when you purchased your home. 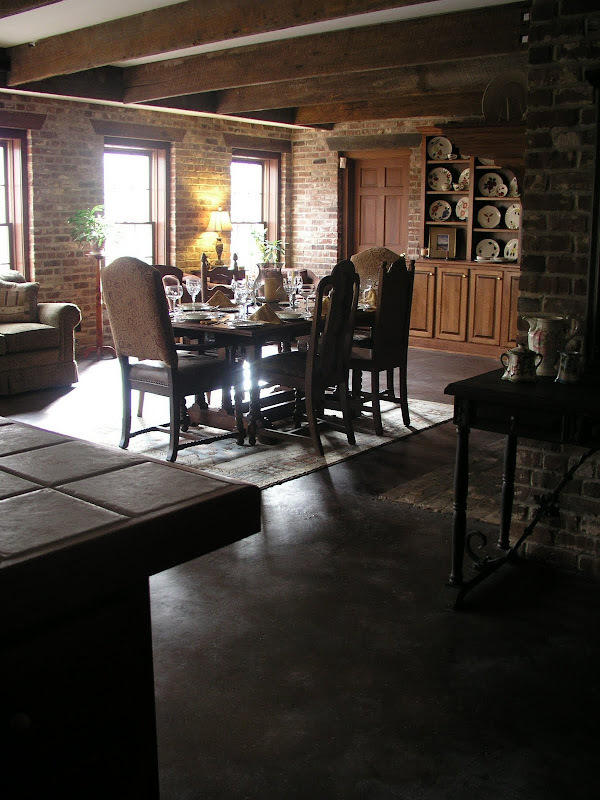 I ask because it looks great & That is my next project .. staining our concrete floors in both the den and dining room. When the Christmas decor came down.. I started ripping out the carpet.Right now I'm tackling getting up the mess that our builders hid beneath the carpet.. spilled paint.. spackle etc. My husband is leary on how it's going to turn out.. but not me lol if I mess it up I can always call Empire to come cover it up. If it was a project you did I'd love to hear your input on it and any pros or cons about having the bare concrete flooring. I agree with everyone. Great room. There appears to be a story about to unfold in that room, or one that didn't get the chance to. And that unique little knife is neat! Very cool. Great work. This is a lovely room for dining. I am so glad I found your blog. Your Tablescapes are wonderful, so creative. The fireplace makes this room so cozy. I am sure your guests don't want to leave.